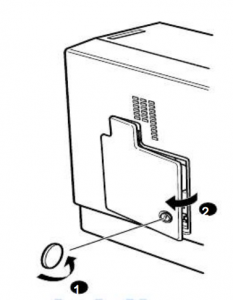 This guide shows how to replace the Epson EMP-5500 projector lamp. Protect your investment and buy a genuine Epson EMP-5500 projector lamp. You will need the Epson ELPLP06 replacement projector lamp. You can find plenty of bargain generic lamps sold over the Internet. But Buyer Beware! These lamps can damage the sensitive and expensive mechanisms in your EMP-5500 projector. They are also more prone to explosions due to the inferior materials and have a shorter life. Even more troubling are the toxic, carcinogenic materials you are exposed to after installing one of these generic lamps. 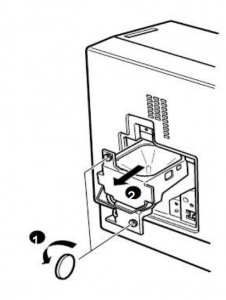 Installing a knock-off lamp will also void the guarantee on your EMP-5500 projector leaving you unprotected should anything happen after installation. Avoid hassles and buy authentic. Look for the seal of approval and buy from an authentic manufacturer. Learn how to protect yourself from counterfeit manufacturers. 2. 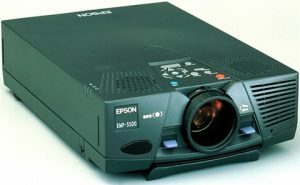 Wait at least 30 minutes to one hour for the Epson EMP-5500 projector to cool internally before opening it up. It should be cool to the touch. Turn off the Epson Epson EMP-5500 projector and let it stand for at least one hour ever 24 hours. An average use of four to five hours per day will ensure longer lamp life.